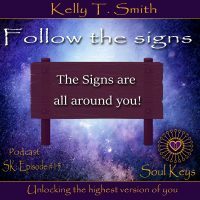 Join Kelly T. Smith for a step by step process of understanding and learning to follow the signs that are all around you. Most of the time, we are so in our stuff, that we cannot see everything clearly. Because we are so emotionally attached to the outcome, or worried about the outcome or upset, fearful, etc…………we can not see the signs that are all around us. The moment you ask for clarity, direction and signs, the universe begins to mirror back to you the answers to your questions. Are you listening?